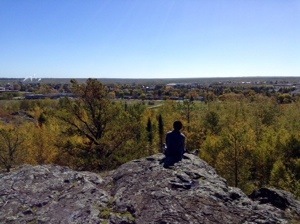 Photo: Aryeh Abramson looks out over Iroquois Falls, Ontario, Canada, where he spent the Sukkot vacation visiting his grandparents. Captured by the Roman General (and later Emperor) Vespasian while defending the Galilee, Josephus ultimately turned against his coreligionists and served as an advisor to the forces besieging Jerusalem during the first Roman-Jewish War. His first-hand observations of the destruction of the Temple and the collapse of Jewish sovereignty are an exceptionally important source for Jewish history–but are they reliable? Taking the name of his Roman patrons, he went on to a brilliant literary career as a prolific apologist for Judaism, but do his later works compensate for his affiliation with the Romans? The Fall 2013 lecture series in Jewish History is scheduled to resume this Wednesday evening at 8:30 pm, Young Israel of Bal Harbour, 9592 Harding Avenue. The lectures are free and open to the community.